The DesignMaster� comes without the adjustable stand. For tabletop projection, simply clamp the stand to any table or work area. Copyboard has two stainless steel clips to hold copy securely and safely effective copy area (41/2" x 6"). It enlarges and reduces with one reversible lens from 4 times down to 70% onto the tabletop. Removed from the stand, it projects horizontally up to 30 times the original size. Vertical projection range of 70% reduction up to 4 times the original size Remove from table stand, place onto a tabletop and project horizontally up to 30 times enlargement Copy size: 6 " x 6" (15 x 15 cm) with copy clips to secure original in place Illumination: 250-watts of photo quality lighting for a brighter image Lens: 200mm precision-ground optical glass Accurate and precise Cooling fan and safety overload circuit, keeps copy cooler Net Weight: 8 lbs. 5-year warranty Made in the U.S.A. The DesignMaster� comes complete with an easy to attach adjustable stand. For tabletop projection, simply clamp the stand to any table or work area. Copyboard has two stainless steel clips to hold copy securely and safely effective copy area (41/2" x 6"). It enlarges and reduces with one reversible lens from 4 times down to 70% onto the tabletop. Removed from the stand, it projects horizontally up to 30 times the original size. High quality single lens, tabletop projector for convenient horizontal projection of artwork, designs, patterns, prints and line drawings. The Prism� lens is reversible to achieve a wide projection range from 80% reduction up to 20 times enlargement in full color. Includes 500-watts of photo quality lighting for a whiter and brighter image. Magnetic door latches and a spring clip keep copy securely in place. Generous 7" x 7" (18 x 18 cm) top-loading, glass covered copy area makes for easy placement of large copy, books, or small 3-D objects. A dual cooling channel system and thermal overload circuit protects originals from overheating. Enlarges artwork and small 3-D objects up to 20 times and reduces to 80% of the original size with one lens. Vertical projection of 80% reduction up to 3� times enlargement onto a tabletop with accessory Prism Table Stand (#225-206) Illumination: 500-watts photo quality lighting for a brighter image (included) Top-loading 7" x 7" (18 x 18 cm) glass-covered copy area with adjustable cover to keep artwork flat and secure Dual cooling system and safety overload circuit keep copy cooler. Lens: 200mm precision-ground optical glass Net Weight: 8 lbs. 5-year warranty Made in the U.S.A.
For vertical projection with the Prism and Super Prism projectors. The Super Prism� is designed for the artist or designer who needs the best in image clarity and accuracy. Ideal for working from a variety of challenging originals like photographs, half tones, and highly detailed drawings. Features a 3-element, color corrected lens for extra sharp images and increased brightness. This Super Lens enlarges originals from 3 to 20 times. Includes extra accessory lens to extend the range from 3 times enlargement down to 80% reduction. Includes 500-watts of photo quality lighting for a whiter and brighter image. Magnetic door latches and a spring clip keep copy securely in place. Generous 7" x 7" (18 x 18 cm) top-loading, glass covered copy area makes for easy placement of large copy, books, or small 3-D objects. A dual cooling channel system and thermal overload circuit protectU originals from overheating. Top-loading 7" x 7" (18 x 18 cm) glass-covered copy area with adjustable cover to keep artwork flat and secure. Enlarges artwork and 3-D objects up to 20 times the original size Included accessory lens extends range down to 80% reduction Vertical projection of 80% reduction up to 3� times enlargement onto a tabletop with accessory Prism Table Stand, #225-206, (accessory lens included with projector must be used with this stand) Features Super Lens: 240mm f/4.5, 3-element color-corrected, precision-ground lens for extra sharp images Illumination: 500-watts photo quality lighting for a brighter image Dual cooling system and safety overload circuit keep copy cooler Net Weight: 9 lbs. 5-year warranty Made in the U.S.A.
A versatile art projector for the beginning artist or crafter, and Artograph�'s bestseller. The Tracer enlarges any design or pattern onto a wall or easel from 2 to 14 times the original size. Projected image can be easily traced and colored as desired. Not set-up necessary and simple to operate. Standard 100-watt bulb included. Dark room required. Enlarges flat artwork and small 3-D objects from 2 up to 14 times onto any vertical surface. Illumination: 100-watt bulb (included) Easy to use Horizontal projection onto any vertical surface. Lightweight and portable Silent operation. Ready when you are - no set up or assembly. Copy size: 5" x 5" (13 x 13 cm). Work in sections with larger designs and prints. Net Weight: 3 lbs. Lens: 200mm optical glass 5-year warranty Made in the U.S.A. 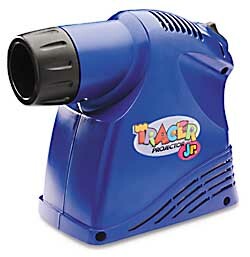 The best enlarger projector for kids, simply place an image (up to 3 1/2" x 3 1/2") and enlarge it up to 8x! This newly designed projector includes 100 watt illumination, a cooling fan, heat resistant inner lining and thermally protected auto shut-down to prevent excessive heat. Use in a dark room for tracing or simply enlarging. Ages 12 and up..